After a slow start at Liverpool, Fabinho has now truly found his feet—but this should just be the start for the summer signing, who has a lot more to give. Fabinho has passed the audition stage that so many of Jurgen Klopp’s most successful signings have had to endure. Such was the surprise at his arrival in the summer that Reds can be forgiven for being left unusually, and understandably, ill-informed as to what their new recruit might offer. The lack of an orthodox defensive midfielder during Klopp’s tenure, too, foreshadowed a tentative start to life on Merseyside. 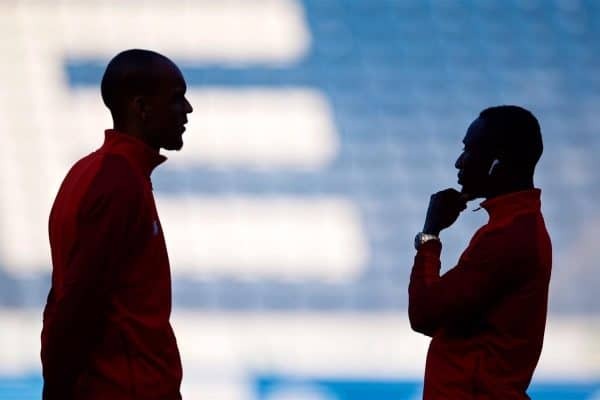 Whilst Fabinho had to adapt to a considerable change in intensity, the manager himself had to re-configure his approach and understand how best to utilise his side’s new deep-lying protector. It took until the 1-0 win over Huddersfield for Fabinho to make his Premier League bow, and even then it was evident he remained in the process of adjusting. He proceeded to supply flashes of his defensive authority as he made his first league start in the 4-1 victory over Cardiff, before again looking off the pace in the 1-1 draw against Arsenal at the Emirates. It wasn’t a case of back to the drawing board as such, but more so a lightbulb moment after a necessary plunge into the deep end. Premature concerns were brewing, Paris Saint-Germain rumours were soon looming and memories of Andy Robertson and Alex Oxlade-Chamberlain as slow-burners had been foolishly buried. Robertson recently empathised with his team-mate’s gradual integration, telling LiverpoolFC.com: “Me and Chambo experienced it last season. Naby is experiencing it a wee bit now, Fabinho has experienced it, Shaq has experienced it. 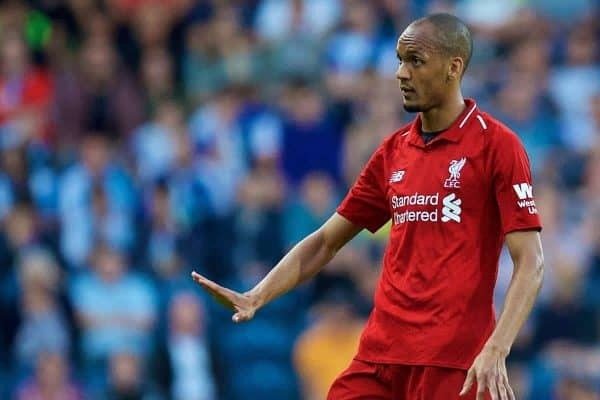 Again, it always required time for Fabinho to mould to an unfamiliar system, for Klopp to hone his instructions for the £44 million man and for Liverpool fans to realise what to expect from the type of player this club has arguably not had since Javier Mascherano. A laboured introduction has been laced with sporadic teasers of an essential component to Klopp’s plans. Almost seven months into his Liverpool career and Fabinho is beginning to assert himself as a valuable figure in this Premier League title charge. The 25-year-old has started in 10 of the Reds’ last 15 league outings, defying initial expectations by surpassing the progression of Naby Keita amid their respective debut campaigns at the club. Who’d have thought it would be the Guinean playing catchup at this stage of the season based on their first impressions? 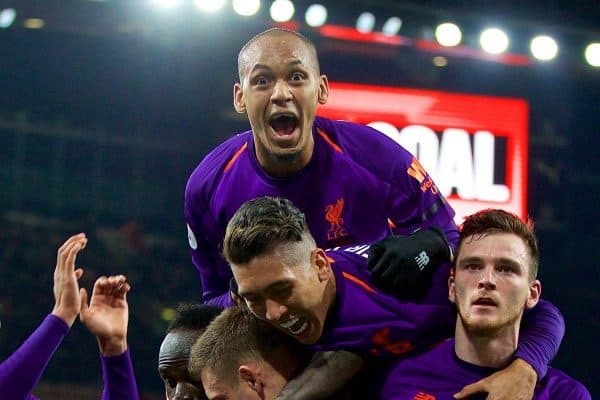 By mid-December, according to Sky Sports, Fabinho was ranked first at Liverpool in tackles, interceptions, successful duels and possession won in the final third. Granted, statistics aren’t the be-all and end-all in Klopp’s setup, but on this occasion they raised the curtain on the No. 3’s responsibilities in this team. It’s his ball retrieval beyond the halfway line, in particular, that stands out on his résumé when considering the magnitude of Klopp’s counter-press. Not only is he disrupting opposition sides in their bid to retain possession, but he is regularly evolving tackles and interventions into Liverpool attacks. His ability to do so stems from both the power and elongation his 6’2″ frame gifts him, as well as an elite intelligence to anticipate second balls and spot the correct moments to step up. The festive period meanwhile nudged his influence alongside a fellow No. 6 into full lens as he continued to flourish next to Gini Wijnaldum. Standout performances against Red Star Belgrade at home, away to Bournemouth, and against Man United and Arsenal at Anfield saw Fabinho start beside the Dutchman, with the occasional usage of Keita on the left of a 4-2-3-1. What has been interesting about his involvement is the flexibility of his job description in accordance to team selection. 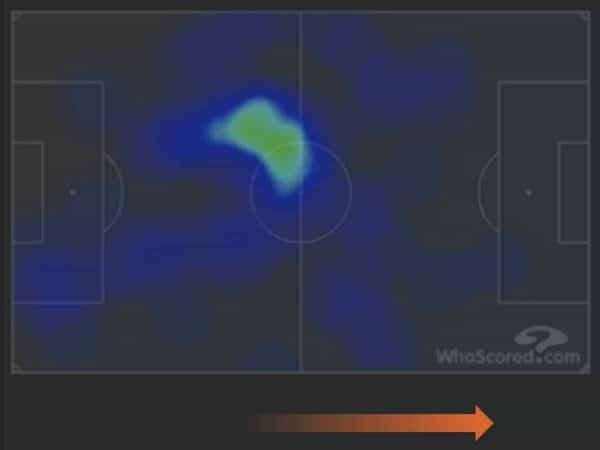 Taking into account his strongest displays, as noted above, the WhoScored heatmaps below depict Fabinho’s subtle variation in positioning. His role in the 4-0 win over Red Star in the Champions League entailed a notably dominant coverage of the centre circle. In comparison, the fluid use of Keita has allowed Fabinho to advance more regularly thanks to the added cover behind him. 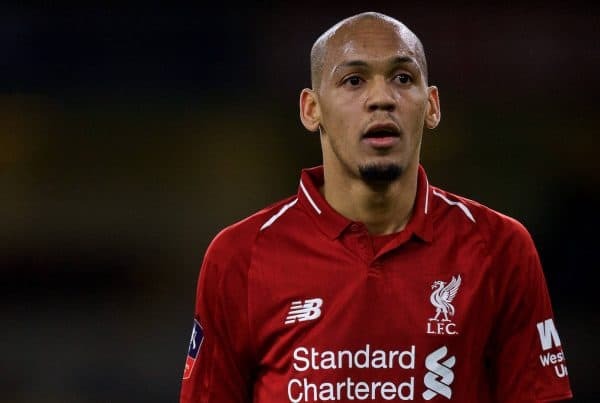 With Fabinho having started alongside Jordan Henderson in midfield just twice this season, it remains to be seen what kind of impact he could have in terms of freeing up the skipper to hunt the ball in higher areas. His 125 touches saw him lose possession only once. 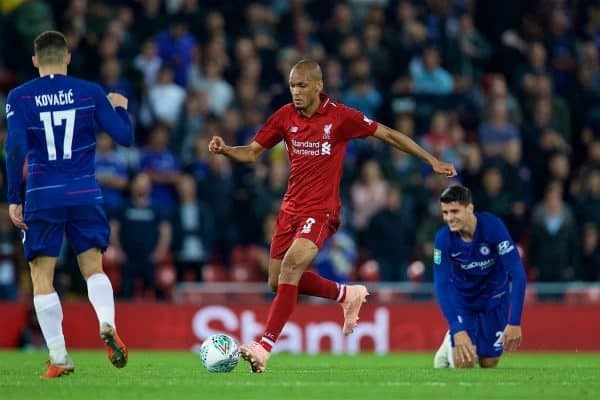 Fabinho’s presence helped bring out the aggression in his team-mate’s game, giving him the freedom to join his forwards in pressing high up the pitch. It’s no coincidence that one of Henderson’s most instrumental performances of the season arrived alongside Firmino’s newest celebratory dance partner. The Reds maestro has managed to exhibit the traits of a conventional holding midfielder, as well as the potential to be so much more. The athleticism, mobility and sense for danger mark the mere foundations over his worth. 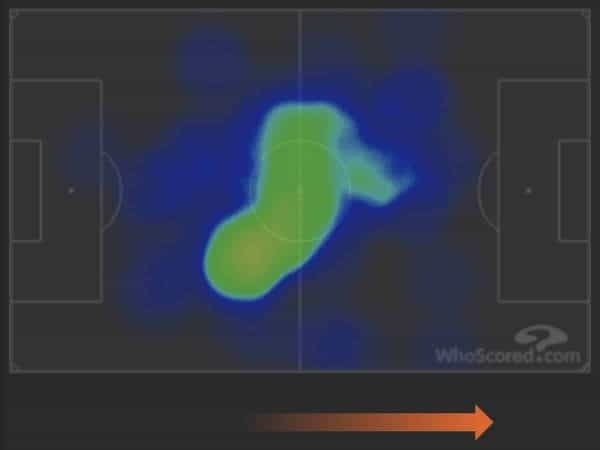 His growing reputation as this side’s top ball retriever gives Klopp both a sponge in front of his back four and another weapon in his bid to force mistakes and trigger attacks with the high press. 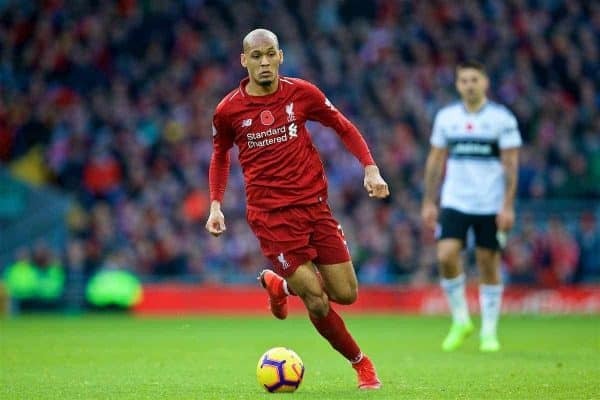 The application of interchanging and rotation to Liverpool’s midfield is seemingly paying dividends in removing the shackles from Fabinho where possible and necessary. A proclivity to choose the right pass hasn’t always been met with the desired execution, but it has supplied a welcome look at his forward-thinking and attentiveness to timely ball retention. His exquisite assist for Sadio Mane against United showcased his less-celebrated finesse and vision, before his pull-back for Mohamed Salah’s goal against Wolves unveiled his ability to drive into the penalty area. For him to restore control for Liverpool as a second-half substitute during the defeat to Man City meanwhile laid claim to his budding importance. This has since been followed up by an unflinching afternoon at centre-back in the 1-0 win over Brighton. Sure, he was partnered by the calming presence of Virgil van Dijk, but his game-high five clearances and 100 percent aerial duel success rate at the Amex reflected a veteran maturity and self-assurance. Fears of a potential layoff with the hamstring issue that saw him substituted in the 87th minute against Palace speak volumes as to his influence of late. Klopp is polishing his summer acquisition into one of his most reliable and accomplished squad members.